After the end of World War II, the world’s superpowers came together to find ways to prevent the repetition of the massacre and the loss of millions more lives. The creation of the United Nations and all its mechanisms (as well as all other international governmental organizations and monitoring bodies) aimed at creating a neutral space where peaceful and diplomatic talks could take place. Indeed, since the creation of the UN, we have not seen (yet) other major global conflicts that could compare to WWII for gravity and scope. However, conflicts, civil wars and violence remain widespread. For instance, the six-years-long Syrian conflict has cost the lives of millions people, has further destabilized the precarious balance in the Middle East and has caused an unprecedented wave of migration towards European shores. To make matters worse, the constant flow of asylum seekers in Europe – and Western countries in general –has fostered the emergence of nationalist and populist movements that promote a close-borders agenda and that identify (almost) all refugees, migrants and asylum seekers with potential attackers and terrorist. The fear of terrorist attacks has further grown after the shooting inside the Bataclan (Paris, November 2015), the cargo running into the crowd in the Promenade des Anglais (Nice, July 2016), the bomb detonated during Ariana Grande’s concert (Manchester, May 2017), and all other attacks to Western cities and symbols. Indeed, concerns for terrorist attacks and for the spread of terrorist ideals – in particular after the tragedy of 9/11 – resulted in an increase of national security and in the emergence of racist and nationalistic movements. Yet, what do people really fear? Is it just a concern for sporadic terrorist attacks or do we fear that a new war (perhaps WWIII) might be around the corner? Are the ideas of “terrorism” and “war” so far apart or are there any elements in common? Let us find it out. (d ) Description of terrorism as “any action, in addition to actions already specified by the existing conventions on aspects of terrorism, the Geneva Conventions and Security Council resolution 1566 (2004), that is intended to cause death or serious bodily harm to civilians or non-combatants, when the purpose of such an act, by its nature or context, is to intimidate a population, or to compel a Government or an international organization to do or to abstain from doing any act”. Unfortunately, the lack of a unitary definition has negative repercussions on the process of creating comprehensive counter-terrorism strategies. As such, although terrorism is prohibited under international humanitarian law, counter-terrorism measures do not always respect international (or regional) standards. On the contrary, the so-called “war on terror” initiated by George W. Bush in 2003 often entailed (and entails) a concerning degree of violence and disrespect for human lives and international law. Non-international armed conflicts, between governmental forces and non-governmental armed groups, or between such groups only. IHL treaty law also establishes a distinction between non-international armed conflicts in the meaning of common Article 3 of the Geneva Conventions of 1949 and non-international armed conflicts falling within the definition provided in Art. 1 of Additional Protocol II. Such attacks could cause the destruction of entire cities and could provoke thousands of casualties. In order to prevent the escalation of conflicts and the use of prohibited or extremely lethal weapons, the United Nations and its partner organizations created conventions and treaties such as the Chemical Weapons Convention – entered into force in 1992 and monitored by the Organization for the Prohibition of Chemical Weapons. Unfortunately, despite the legal prohibitions, the use of chemical weapons by both State and non-state actors has been recorded in several occasions. Terrorism is one of the main issues discussed in the news today. The fear of terrorist attacks and concerns for the spread of extremist ideas have increased in the last years, following a series of horrific attacks to several European and American cities. Terrorist groups often target civilians and aim at spreading chaos and fear, whereas wars are fought for economic and geopolitical reasons; furthermore, IHL prohibits the targeting of civilians during armed conflict. Giulia Squadrin. 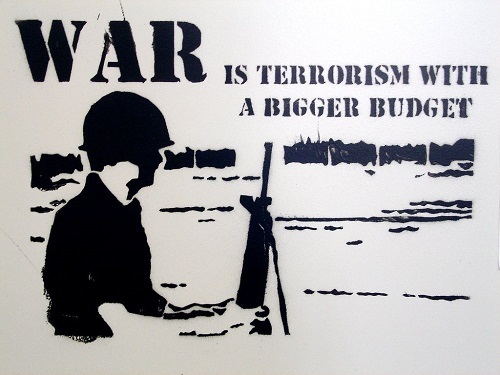 "Difference between War and Terrorism." DifferenceBetween.net. October 25, 2017 < http://www.differencebetween.net/miscellaneous/difference-between-war-and-terrorism/ >.